The strong, sturdy and handsome Acadia Merlot Stair Stepper Bunk Bed brings a new dimension to solid wood bedroom furniture for your kids and teens!. A warm and rich Merlot lacquered finish on solid wood throughout will provide lasting great look and durability for many years to come. The Acadia Stair Stepper bunk bed combines a classic, clean Mission styling with durable 100% solid wood construction and great space saving features to make it one of our favorites. The super safe step-style entry makes it easy for your little ones to get in and out of bed and features a built-in 4 drawer chest on the side. A twin size bed on top and a twin size bed below provide the space-saving element you are needing. You also have the option of making great use of the space below the lower bed by adding a 3 Drawer Unit for extra storage or a pull-out Trundle Unit for that extra sleep space. 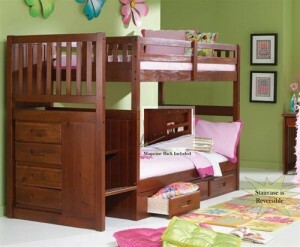 The Acadia Stair Stepper bunk bed is sure to please even the most discriminating child! Shown here with optional 3 Drawer Unit.